'Bang Restaurant' on Merrion Row , just a stone throw away from St Stephen Green has always been a popular haunt of what was once the embodiment of the Celtic Tiger Years. It was a balmy Wednesday evening when we visited the Bang after a well overdue visit. 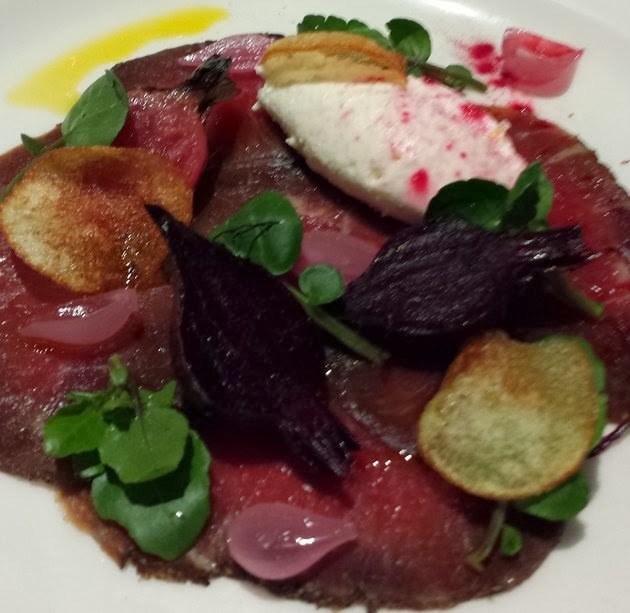 The Restaurant was elegant as ever and still delivered a relaxed and warm atmosphere . On our request , we were seated in the downstairs dining room , which I find very cosy and ideal for a romantic dinner a deux . The waitress was friendly and helpful . We perused an exciting menu and from what I could see based on seasonal offerings from some of Ireland's best artisan producers , among others Brendan Guinan micro veg & herbs , Mourne Seafood , Keelings & Sheridan Cheeses . 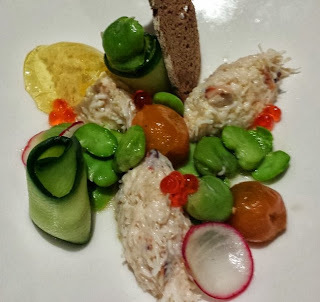 Three perfect quenelles of Crab meat sat in the middle of a beautiful display of Salted Cucumber shavings , Pickled Radish , Marinated golden tomatoes , Broad beans & a disc of White Tomato jelly. The fresh and delicious sweet crab meat was an enjoyable mouthful with a delicious smack of freshness from the cucumber and broad beans , while the white tomato jelly and marinated tomatoes just melted . A smashing and flavoursome Starter . Our next starter of Spiced Hereford Beef & Whipped Fivemiletown Goat Cheese @€13.75 was equally beautifully presented , While the goat cheese was light and velvety , the Spiced beef was a tad on the bland side , but together with the pickled pearl onion and sweet roasted baby beetroot , it delivered a nice forkful on the palate . 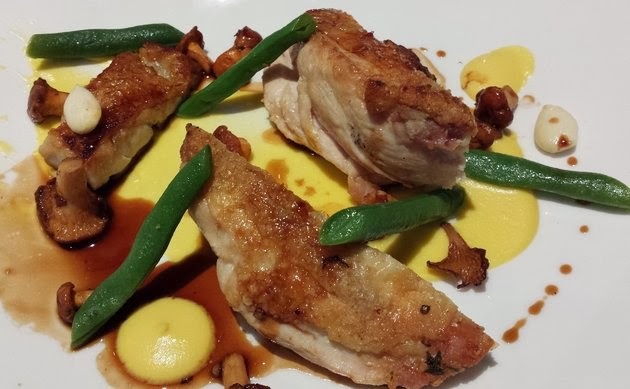 We continued with a delicious Roasted Fermanagh Chicken with Crispy thigh @€24.45 . The Chicken breast was beautifully cooked , I could only presumed that it was steamed then pan fried. The crisp skin gave way to some moist and succulent flesh , contrasting nicely with the sweetness of the Sweetcorn pureé . Perfectly cooked Fine Beans ,Fresh Almonds and Girolles mushrooms made the whole ensemble a very tasty and appetising dish . 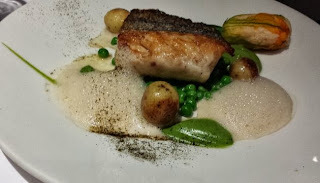 Next was an elegant plate of Kilkeel Hake & Crab stuffed Courgette flower @€26.95 . Although the portion wasn't huge , there was no denying the delicate flesh of the hake , which was beautifully cooked , while the stuffed courgette flower was just divine . Fresh garden peas , Pea pureé , Baby new potatoes and a Dillisk Lemon Verbena foam delivered a clear winner . 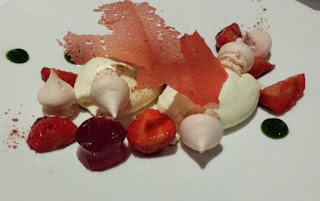 To finish , we had a simple but delicious dessert of Macerated strawberry & Mascapone cream . Full of flavour and with enough bite and acidity , the strawberries went down a treat with the mascarpone cream and the basil gel . Tiny meringues and a strawberry tuile provided a welcome contrast . On the other hand , far less lighter than it's description let on , a Pistachio Chibouste & Cherry soup was disappointing . 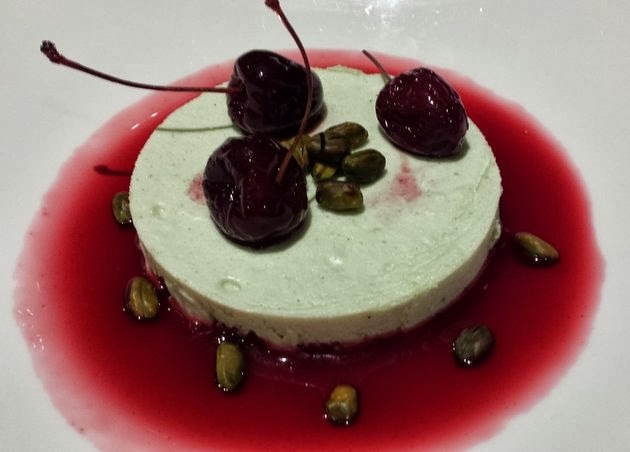 The mousse was very heavy and the Cherry soup was far too sweet . All in all , it was a very pleasant meal . The service was attentive but not obtrusive and the atmosphere was cosy and perfect for a tete á tete .